Dow Corning 732 multi-purpose acetoxy RTV silicone sealant is ideal for sealing and bonding and used as a space-filling rubber adhesive that develops into a formed gasket. Dow 732 consists of a one-component adhesive sealant that cures at room temperature when it is exposed to the prevalent moisture in the air. Its no-sag properties allow for easy application and cures to a durable, yet flexible rubber quality. Dow 732 adheres to many glass, metal and plastic substrates and possesses an acetoxy curing system. Some other adhesion applications include the bonding of appliance, heating, air conditioning, aircraft, automobile, truck and trailer parts. Dow 732 also forms into excellent seals for pumps and compressors and works wonders on sheet metal and duct working. All in all, this RTV silicone protects from damaging, invading moisture and holds its own against extreme weather conditions. 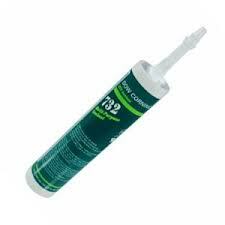 Dow Corning 732 clear multi-purpose acetoxy RTV silicone sealant is stable and stays flexible from -76 F to +356 degrees F with short peaks up to 401 degrees F. This silicone sealant possesses excellent dielectric properties and complies with MIL-A-46106 and with FDA 177.2600.